The coveted neighborhood of Lodge, the namesake of the luxurious Pebble Beach Lodge, contains within its boundaries some of the most exclusive, stunning estates in the world. As 17 Mile Drive curves and winds through windswept Cypress trees and panoramic vistas of turquoise water, architectural gates of stone and artisan craftsmanship hint at the beauty of the homes secluded in their private sanctuaries. At the northern point of the area, you will find Cypress Point, the private and revered golf course that escorts golfers through the Del Monte Forest to the rocky coast as they play 18 holes. As you continue to the south you will reach Peter Hay, a fun yet deceivingly challenging 9-hole golf course where you often see youngsters learning the art of golf with dad and mom. Finally you will reach the Pebble Beach Links, a destination on every golfer’s wish list, with a reputation that needs little introduction. At the southernmost tip the neighborhood ends at the gates to Carmel-by-the-Sea homes, where you will enter a fairytale town of cobblestone streets and charming cottages with the sophistication of a shopping, dining and recreational haven. Click here to preview all Pebble Beach homes for sale in the Lodge neighborhood. For all available Pebble Beach real estate, click here. 13 homes in this neighborhood sold in 2018. 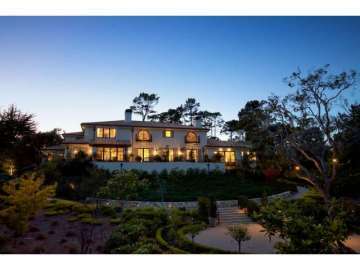 The most expensive home to sell, sold for 28 million and was one of the few Oceanfront properties in Pebble Beach, known as Canary Cottage with 8 bedrooms, 7 bathrooms, 5,279 SqFt of living space on a 2.22 acre lot. The least expensive home to sell in this neighborhood was a 6 bedroom, 5.5 bathroom home with 7,367 Sqft of living space on almost an acre. 11 homes sold in this neighborhood in 2017. The most expensive home to sell was a newly constructed home with 6 bedrooms, 7 full and 3 half bathrooms, 9,956 SqFt of living space on 1.73 acres with sweeping views of the Ocean and down the coast to Big Sur. The least expensive home sold for 2.2 million for a 2 bedroom, 2.5 bathroom home with 2,956 SqFt of living space on 27,43 SqFt lot. In 2016, 11 homes sold in this neighborhood. The most expensive home that sold, sold for 18.5 million and was a 7 bedroom, 7.5 bathroom, 8,300 SqFt estate on 2.42 acres and was located on the 12th green of the Pebble Beach Golf Course Links and featured Ocean Views. The least expensive home to sell, sold for 3.25 million for a 3 bedroom, 2.5 bathroom, 3,335 SqFt estate on .889 acres with panoramic views. 13 homes sold in this neighborhood in 2015. The most expensive home to sell sold for 11 million and was a 4 bedrooms, 5 full and 2 half bathroom, 4,086 SqFt estate on 1.5 acres and was an Oceanfront property on the famous 17 mile drive. The least expensive home sold for 1,992,500 for a 4 bedroom, 3 bathroom, 2,544 SqFt estate on 1.5 acres. There were 12 homes sold in the neighborhood in 2013. The most expensive home sold was a 7,200 SqFt Mediterranean Villa on a 69,696 SqFt lot, which sold for 12.5 million. The least expensive was a 3,380 SqFt home on a 6,417 SqFt lot, which sold for 1.925 million. In 2012, 10 homes sold in this neighborhood. The most expensive home sold for 10,583,333 and was 9,630 SqFt and was situated on a 40,902 SqFt lot with stunning ocean views. The least expensive home sold in the neighborhood sold for 1.827 million and was 4,100 SqFt on a 72,196 SqFt lot. For a detailed analysis of Pebble Beach real estate sales check out our monthly Community Market Reports. To live in this emerald jewel coastline neighborhood, one would have the very best Pebble Beach has to offer at your doorstep. Walk to the Pebble Beach Concours d’Elegance to view history come to life with vintage and classic automobiles, attend the annual AT&T Pro Am golfing events and many more Pebble Beach Events which draw visitors from around the world to this uniquely beautiful community. After a game of golf perhaps enjoy a short stroll to the Lodge where you are pampered by a massage and afterward enjoy a casual meal at The Bench restaurant, sitting outside by a warm fire as the ocean air chills with the setting sun. After a day of activity, invigorated by salt and sea, you return to the glow of your home by the ocean, truly a dream come true.